CRUNCH TIME: Seven days into the new fiscal year, an overdue budget bill was filed Friday morning and enacted in both branches within eight hours. Asked about the short timeline for members to review the bill, House Ways and Means Chairman Brian Dempsey said, "I give the members sort of a lot more credit that they're able to look quickly and figure out if local aid and Chapter 70 are going up or down....This is a multi-month, several month process. They're very well attuned to what levels of spending there are. I know they are, because they're all sending letters on increased funding. ... I'm confident they'll be comfortable." BOSTON — Consider Beacon Hill’s mellow harshed. To the extent that the Fourth of July break was supposed to be a timeout for House and Senate lawmakers deadlocked over an annual state budget bill and legislation regulating legal marijuana, it didn’t quite work out that way. The smoke had no sooner cleared from the fireworks over the Charles River than lawmakers returned to work midweek to find that tensions simmering behind the two major issues before the Legislature were ready to bubble over. Deadlines had already been blown. Speculation about sticking points was swirling. And lawmakers were being asked to defend why Massachusetts, a state prideful of bipartisanship, was one of just a handful nationwide without a fiscal 2018 budget in place. A $40.2 billion budget deal to fund the government for the next eleven-plus months would eventually emerge from the fracas and be sent to Gov. 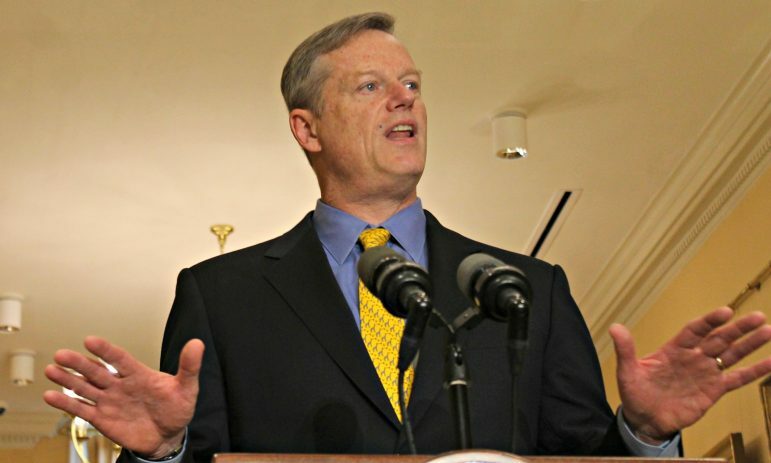 Charlie Baker for his review, but not before a few punches were thrown. 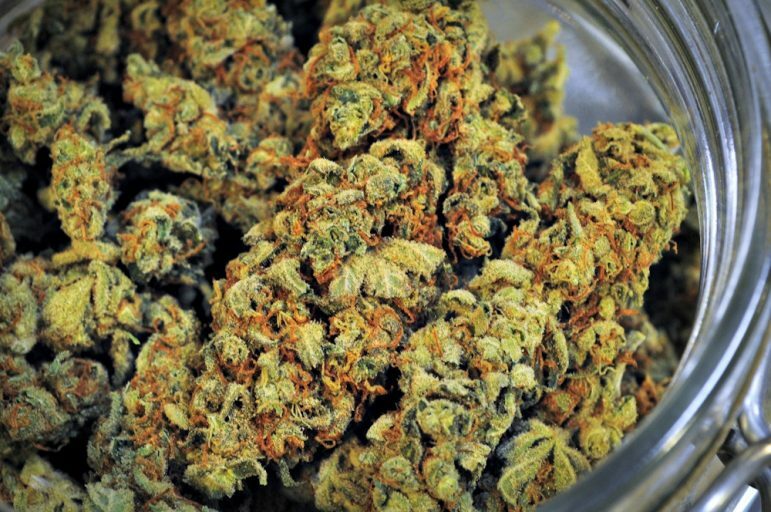 The post-Fourth of July pyrotechnics got started early Wednesday evening when, after the branches broke for the day without agreement on marijuana or a budget, sources close to the negotiations told State House News Service that talks over both issues had become intertwined. The mere suggestion that House and Senate leaders might be using items in one bill as leverage for a deal on the other drew swift and forceful denials from both House Speaker Robert DeLeo and Senate President Stanley Rosenberg. But at times it became unclear whether the top Democrats were denying that attempts at cross-topic horse-trading had taken place, or simply their own involvement. 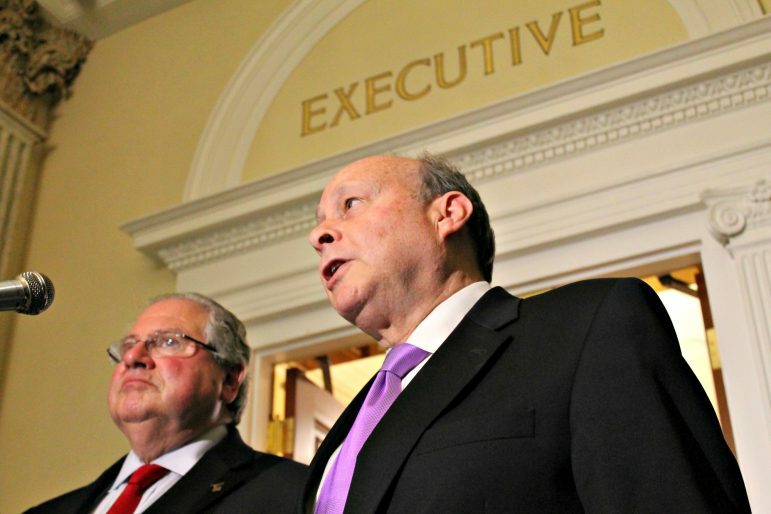 Rosenberg chalked up the talk of linkage between the two conference committee negotiations to “mischief makers” looking to spoil the stew, but DeLeo took it one step further. Despite his disavowal that the House would ever stoop to such politics, he suspended the House’s participation in talks over marijuana regulation to remove “distractions” and focus on getting an already-late budget to Gov. Baker’s desk. That move sparked an array of increasingly agitated responses from his Senate counterpart. Rosenberg early Thursday, with a smile on his face, proclaimed himself “puzzled” by the maneuvering before suggesting the Senate can “walk and chew gum at the same time” and inviting the House to do the same. But when it became clear that a budget deal was imminent and that, just maybe, DeLeo’s posturing achieved its intended result, the leader from Amherst, this time a bit more wide-eyed, declared it “absurd” that the pot-talk suspension had anything to do with the budget compromise or that negotiations might have been linked prior. “Whoever made up those rumors and spread them had an intention, a nefarious intention. There were never any discussions linking the two. It was b.s.,” he told reporters. It was a rather unusual outburst for the typically good-natured leader whose hallmark has been decorum. The talk of linkage between pot and the budget clearly struck a nerve throughout the building. But in some ways legislative leaders played a role in inviting those types of leaks and speculation about motives and gamesmanship as they insist on a level of secrecy that leaves even the governor guessing about what goes on behind closed doors, where the important decisions about the major bills are made. Seven hours and 56 minutes after House and Senate leaders filed their compromise budget bill with the House clerk, the voting was done and the fiscal 2018 budget — a slimmed-down version of what lawmakers passed this spring — was on its way to Baker. 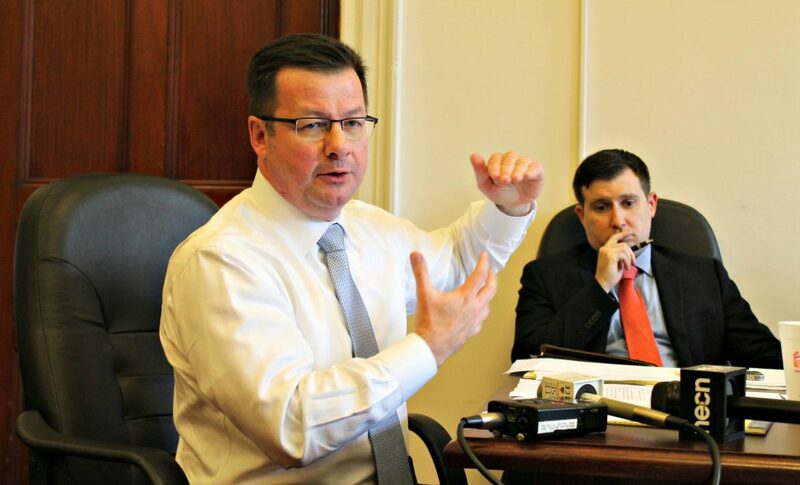 House Ways and Means Chairman Brian Dempsey tried to put a shine on the budget, which lowered tax projections for next year by $733 million and forced cutbacks throughout. He told House members before they voted that most programs and agencies would still see an increase, albeit one smaller than once envisioned. The $40.2 billion fiscal 2018 budget that lawmakers sent to Gov. Charlie Baker’s desk Friday differs sharply from the spending plans debated over the first six months of 2017, and serves as a stark reminder that the state’s tax collections and its economic health are not as closely intertwined as they used to be. Baker gets 10 days to review and act on the budget, and the governor is still working through fixes needed to balance last year’s budget. Lawmakers who support a surtax on high earners are hoping voters will agree with their plan to draw up to $2 billion more from taxpayers for state spending. But Baker and the Legislature will need to get through one more budget cycle before then, and elected officials will likely be eager next year to show voters a more investment-oriented plan than the bill (H 3800) before Baker that holds state spending flat despite a growing economy and a low unemployment rate. When Baker signs the budget, Massachusetts will become one of the last states to put an annual spending plan in place. But the overdue work is not done — lawmakers and Baker have yet to agree on changes to the voter-approved recreational marijuana law, which remains before a conference committee charged with reconciling House and Senate bills that take different approaches to taxation and local control of retail pot shops. Other developing storylines include Wednesday’s confirmation hearing for high court nominee Judge Scott Kafker, continuing debate over whether lawmakers will grant retailers a sales tax holiday, and the gathering of governors late next week just over the border in Providence. Baker held back from any snap assessments on the budget that legislative Republicans lamented they had little time to review before being asked to vote, but he did vow to “continue to pursue” MassHealth reforms left on the cutting room floor. Legislative leaders, perhaps ironically given their processing of the budget on Friday, said they felt rushed to decide how to handle the proposal put on their desks just weeks ago. “As requested by the Legislature, the administration proposed a comprehensive package that was carefully developed and supported by leading members of the health care and business communities to control spending, protect taxpayers and preserve the health care safety net. The administration will continue to pursue the reforms necessary to stabilize the health care safety net and protect taxpayers from picking up the tab for more worker’s health coverage,” Baker spokesman Billy Pitman said in a statement. Lawmakers accepted Baker’s recommendation for a new two-tiered assessment on employers that will ask businesses over the next two years to contribute $200 million to help pay for rising MassHealth expenses. But Dempsey suggested a more “public process” to consider the eligibility and benefit reforms sought by the administration that were an integral part in winning the backing of employers, and the reason major business groups came out in opposition to the final budget plan asking employers to foot more of the Medicaid bill. “Without these reforms, the state budget and the state economy will continue to buckle under the weight of health care cost growth,” the business groups wrote to lawmakers in a last-ditch appeal. When the dust had settled, only 11 lawmakers, including just one Democrat, voted against the budget compromise. The Baker administration, which has refused to disclose specifics about its budget-balancing efforts for the fiscal year that ended a week ago, notified lawmakers that it plans to raid some trust funds to collect nearly $140 million. Sweeps of more than two dozen trust funds, which the administration plans to execute no sooner than mid-August, will sap funds set aside for distressed hospitals and water supply protection and divert funds set aside for special purposes to the state’s General Fund. Baker has spent much of his two-plus years in office arguing against tax increases and maintaining the state does not have revenue problems. The trust fund sweeps show both that there are still major pockets of revenue available within state government and that state officials are hungry for revenue to balance the budget, since tax collections are trickling rather than pouring in despite a low unemployment rate. According to a letter obtained by State House News Service, the administration intends to sweep up to $23.5 million out of the Distressed Hospital Trust Fund, $3 million out of the Regional Tourism Councils Trust, and $320,903 out of the Racing Stabilization Trust Fund. 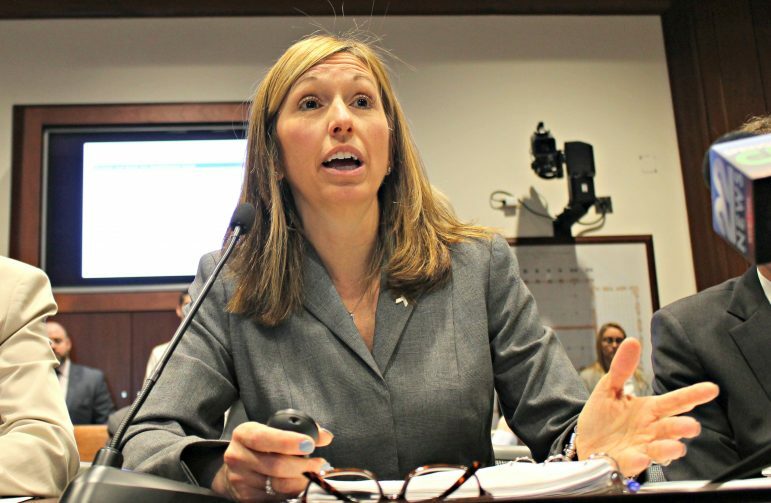 “This list of accounts has been shared with state agencies to ensure that they are aware of my office’s intent to sweep these trusts,” Administration and Finance Secretary Kristen Lepore wrote to lawmakers June 30, the last day of fiscal 2017. According to the administration, the trust-fund exercise is still in development until the fiscal 2017 books are closed this fall. State law enables the secretary to direct the comptroller to carry out trust fund sweeps, requiring a report to the House and Senate Ways and Means committees 45 days before the transfer. The proposed sweeps total $139,258,319. Usually set up for a specific purpose with dedicated revenue streams, trust funds sometimes serve as piggy banks for state officials to crack open when in need of some cash. In 2012, the Patrick administration softened the blow of MBTA fare hikes by sweeping $51 million from the motor vehicle inspection trust fund into the transit agency.